Supermarket Best Buy September 2009. Yes, I know what everyone is saying it has been a while since you gave us a new supermarket best buy, we here at the Whisky Boys are very sorry indeed and we shall endeavor not to let a delay like this happen again. This months supermarket is Morrison’s in Falkirk, and the Whisky is the 1 litre size bottle of the Famous Grouse. One good thing that Morrison’s do is that on the price label they actually give you the date that the offer runs until. Following are some facts that some readers/drinkers may not know. The Famous Grouse is no. 1 whisky in Scotland and no. 5 blended whisky worldwide. The Famous Grouse is exported to 100 countries. 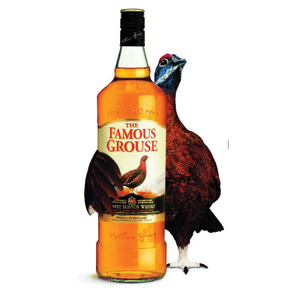 Created in 1896 by founder Matthew Gloag, it was originally called The Grouse Brand. The brand became so popular that on August 11th 1905 it was renamed The Famous Grouse. The Famous Grouse Experience is located at Scotland’s oldest working distillery – Glenturret. Originally established as a single malt distillery in 1775, today The Famous Grouse Experience is the most visited distillery in Scotland. (www.thefamousgrouse.com/ls/en/visitus). The Famous Grouse incorporates two of Scotland’s best single malts, The Macallan and Highland Park. These deliver a richness of flavour that no other range can match. Please, if you get a chance visit the excellent web site at The Famous Grouse, very user friendly and stores a wealth of knowledge and history. Now to get down to the nitty-gritty “how much” well, from Morrison’s Jim only paid £14.98 for the litre bottle and this offer is open until September 20th, go on, go out there and buy a litre or two, we think it is an excellent buy. As always when you give them over your money tell them the Whisky Boys sent you. The simple answer to this I do not have one, I have many !!! Previous story Is This Your Top Ten Whisky?